July 20, 2016: Aerospace analysts had somewhat different takes on the commercial aviation portion of the Farnborough Air Show. 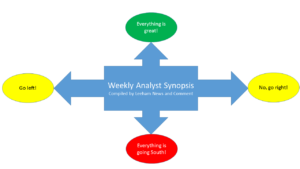 This week’s analyst synopsis includes some of the analyst reports. Between now and the end of the month, earnings season begins reporting the second quarter results. Airbus reports July 27. So does Boeing. Bombardier and Embraer report after July. July 19, 2016, © Leeham Co.: If anything came out of the otherwise dull Farnborough Air Show, it was that the Middle of the Market airplane debate is as muddled as ever. Boeing didn’t launch, or even say much, about the prospective 737-10, a slightly larger version of the MAX 9 intended to close the gap between the 9 and the Airbus A321neo. 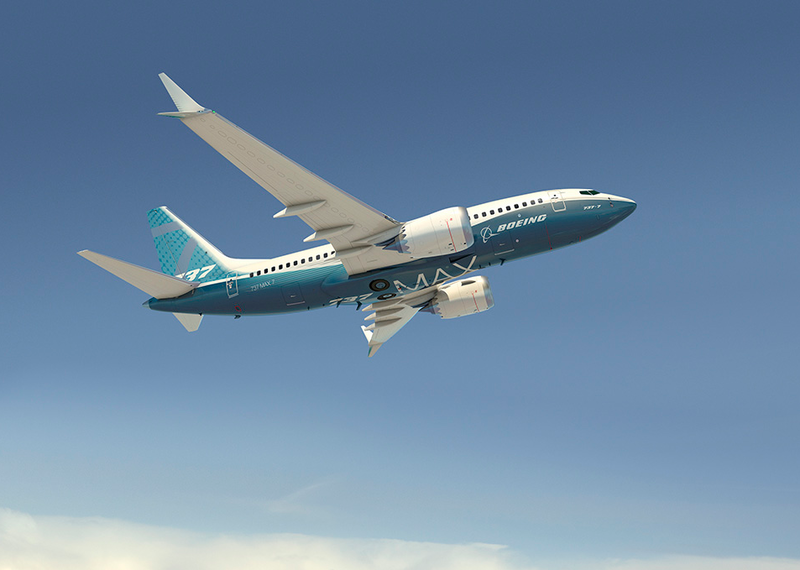 Boeing illustrates the 737-8-based MAX 200 as a separate model in its product line up. The 737-10 will slot in above the MAX 200, if built. Boeing increased the demand in its 20-year Current Market Outlook for the small, twin-aisle airplane by 5%–a move Airbus claims is aimed at the Boeing Board of Directors to entice it to approve launch of the New Mid-range Aircraft, or NMA as Boeing now calls the MOM aircraft. Airbus said the MOM sector ends at 240 seats (single class) and only a single-aisle airplane makes sense. This is a shift from long-standing messaging that the A321neo covers the lower end of the MOM sector and the A330-200/800 covers the upper end. This message was advanced as recently as the Airbus Innovation Days at the end of May. With the rhetoric changing a bit, is it time to redefine the MOM sector? 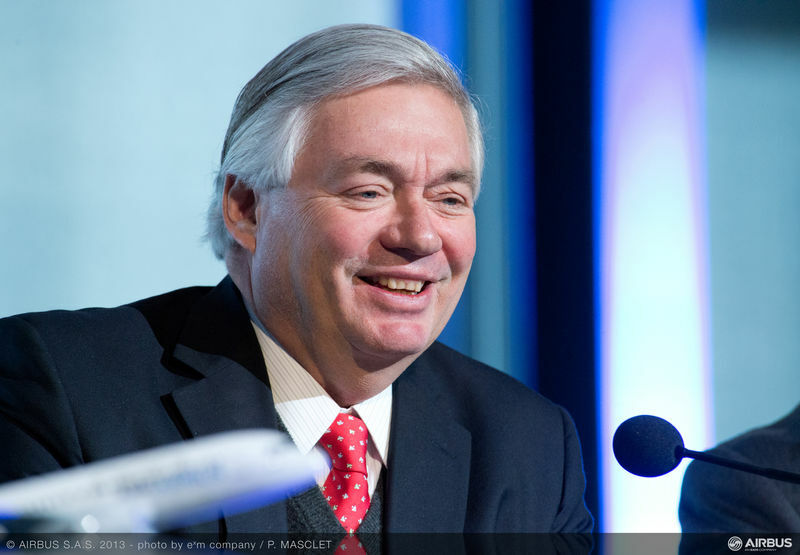 John Leahy, Airbus COO-Customers. Airbus photo. July 14, 2016, © Leeham Co., Farnborough Air Show: Basking on an order for 30 A321LRs on the final day of the Farnborough Air Show, Airbus’ top salesman said the Middle of the Market sector stops at 240 passengers and it’s best served by a single-aisle aircraft. John Leahy, Chief Operating Officer-Customers, said twin-aisle aircraft down to 240 or even 220 passengers don’t work economically against a single aisle. The A321LR (Long Range) seats a maximum of 240 passengers and it is single-aisle. Even though Airbus has a 250-seat A330-200R (Regional) and an A330-800 (7,200nm-plus range), Leahy didn’t attempt make a case that these aircraft are suitable for the MOM sector. A 767-200/A310 size replacement isn’t viable. Boeing’s 20-year market forecast for the mid-sized twin-aisle is for consumption for the Board of Directors. The A330-200R and A330-800 aren’t good MOM aircraft. July 13, 2016, ©. 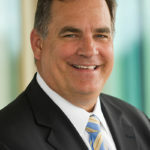 Leeham Co, Farnborough Air Show: Mike Delaney, Boeing’s Vice president and General manager for Aircraft development in the Commercial Airplane division, promises unchanged delivery times despite late changes to the company’s 737 MAX line-up. Delaney went through the changes for the MAX program as part of a larger presentation, outlining the status for all ongoing aircraft developments within Boeing at the ongoing Farnborough Air Show. April 12, 2016: Prices for Boeing and Airbus planes are set through the remaining decade, meaning any cost-cutting being pursued by Boeing will flow straight to the bottom line, a new note issued yesterday from Bernstein Research concludes. “Pricing on more than 80% of deliveries is already set through the decade,” the note says. “Despite the competitive pressures, however, the reality is that most of the competitive situations are about deliveries in the next decade. This creates a situation in which most of every dollar of cost savings will flow to margin during this decade because most of the planed deliveries are already priced. The same is true for Airbus. “This has not been the case in prior cycles because backlogs then tended to be only about three years of production, rather than the eight years that we see today. In those cycles, Airbus and Boeing would cut costs, but then compete away the value. That price competition will now be happening primarily on deals for delivery after 2020,” Bernstein says. Enthusiast concept of Boeing Middle of the Market airplane. via Google images. March 30, 2016, © Leeham Co.: Boeing is unlikely to develop a Middle of the Market airplane for a sector that could be a “mirage,” write two aerospace analysts. Buckingham Research, in a note issued yesterday, did a “deep dive” into the MOM potential and concluded there isn’t a big enough market to support development of a new airplane. Buckingham recently upgraded Boeing stock to Neutral (Hold) from a Sell. Bernstein Research, in a note published March 15, ventured that the MOM demand could be a “Mirage of the Market.” Bernstein is a Buy on the stock. Goldman Sachs remains in the camp that Boeing may well proceed with development of a MOM airplane, at the cost of billions of dollars. Goldman concludes Boeing is in a lose-lose situation with the MOM. Goldman is a Sell. March 1, 2016, (c) Leeham Co.: The manufacturers and their customers remain unclear about the need and design of the so-called Middle of the Market aircraft, their representatives said at the ISTAT AGM today in Phoenix. The business case has yet to be proved. We’re at the 2016 ISTAT AGM in Phoenix and will be reporting on presentations and news from the sidelines. Van Leeuwen, the banker, said financiers would need to see at least 1,000 MOMs in the market with a broad customer base to feel comfortable financing the airplanes. Aug. 31 2015, ©. Leeham Co: After examining the characteristics of the Boeing 767 to serve the market segment that Boeing is studying for its Middle of the Market (MOM) requirement, the 225 passenger/5000nm sector, we will now finish the series by looking at how the 767 can be made economically more competitive. We will study the influence of improved aerodynamics like Aviation Partners Boeing’s Split Scimitar Winglet for the 767. We will also look at what engine PIPs can provide and also look at what a re-engine could bring. Finally we examine at what happens when we add crew costs, underway/landing fees and maintenance costs to form Cash Operating Costs (COC) followed by capital costs to form Direct Operating Costs (DOC). Boeing’s 767 has the right cross section for passenger transportation in the 225 passenger/5000nm segment. Its wings and empennage are too large, however. We make them work harder by transporting the 767-300ER fuselage and passengers. We also introduce aerodynamic and engine improvements. Still, the fuel consumption per seat mile is considerably higher than modern alternatives. At a Cash Operating Cost and Direct Operating Cost level, the higher fuel consumption has less influence in today’s fuel prices. The result is that the 767-300ER becomes an interesting alternative as long as the fuel price stays low. Aug. 31 2015, ©. Leeham Co: Last week we started to look at Boeing’s 767 to see if it can serve the passenger and range space which is not well covered by modern aircraft: the 225 passenger/5,000nm sector. Boeing calls this the Middle of the Market or MOM. Boeing recently said that there is some increased interest for the 767. We analyze why and what can be done to increase any chances of it having a new life as a passenger aircraft. We started with comparing the 767’s different variants to the most likely MOM aircraft from our series “Redefining the 757 replacement requirement for the 225/5000-sector”. We will now continue and look at the 767 in detail, its strong suits and its less efficient areas. We will also discuss what can be made to address the less efficient areas. Boeing’s 767 has the right cross section for passenger transportation in the 225 passenger/5,000nm segment. It also carries cargo containers, not as efficiently this time. We show what the consequences are. Finally the wing is not the slender wing of the modern aircraft. We show what impact it will have on overall efficiency. Combined with engines from the 1990s, this gives less than stellar fuel economics. We investigate what can be done about this and how much of an impact it will have in today’s low fuel prices. Boeing program update at Paris Air Show 2015. June 16, 2015, Paris Air Show, c. Leeham Co: On the second day of the Paris Air show we visited several Boeing briefings. 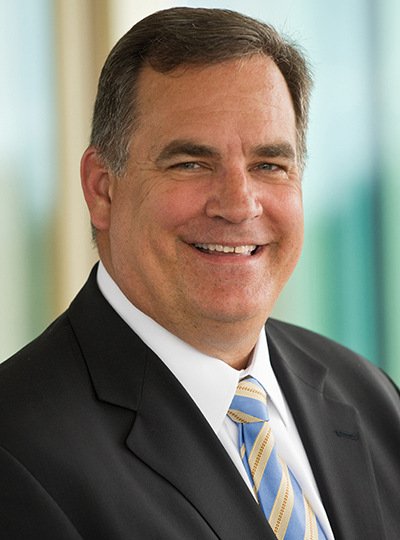 The first was Boeing Commercial Airplanes (BCA) update with BCA President and CEO Ray Conner. He elected to not do the usual slide show speech as all slides were available as handout. Instead the whole session was turned into a Q&A, which was good. All hot topics were discussed as questions from the audience. As many were also covered in Boeing’s next session, BCA development update, I will handle these there. The topics that did not come up in the second briefing were Boeing’s Middle of the Market (MOM) studies for a new mid-range aircraft with 200-250 seats and Boeing’s view on the VLA market. Let’s take MOM first. Conner confirmed that Boeing now has identified that there is a market of around 1.000 aircraft over 10 years which is not served by a suitable aircraft. He dismissed this market being covered by Boeing’s 737 MAX 9 or the Airbus A321LR, both being too small and not having enough range. Range requirement from the many airlines they had visited over the last year was 4,500-5,000nm. The MAX 9 and A321LR have advertised ranges of 4,000nm or less. Conner said the next step is now to study if Boeing can build an aircraft to serve this market at the price required by the market. “We are early in the studies and don’t expect any concrete decision soon.” He could also not answer if any MOM aircraft parts or technologies could be shared with an up-and-coming replacement for the 737 MAX.